Mangaluru, Nov 20, 2018: Co-operative banks in Dakshina Kannada district are providing very competitive and good services when compared to commercial banks, said SCDCC Bank Chairman M N Rajendra Kumar. He was speaking after inaugurating a convention organised as part of 65th All India Co-operative Week at the SCDCC Auditorium on November 20, Tuesday. He said the co-operative banks are even in the lead in adopting modern technology and cited Rupay Kisan Credit Cards. 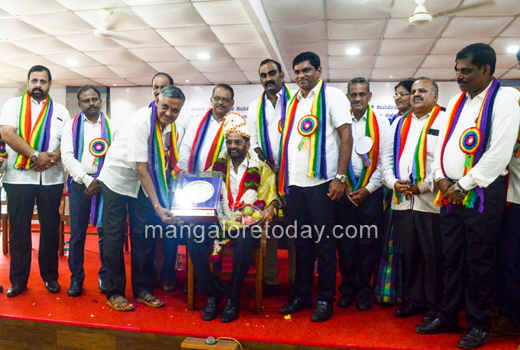 K Raviraj Hegde, President of DK District Milk Producers Union, DK and Udupi District Co-operative Fish Marketing Federation President Yashpal A Suvarna, CAMPCO Director Shankernarayana Khandige and others were present as chief guests. Deputy Registrar of Co-operative Societies B K Saleem, Co-operative Week Celebration Committee President K Jairaj B Rai, Vinaykumar Soorinje and others were present. Prior to the function, a Sahakari Nadige was taken out from Bunts Hostel upto SCDCC Bank.